The Beatles 50 Years Ago Today: June 20, 1967. Beatles Radio: The Beatles, Solos, Covers, Birthdays, News The Fab 4 and More! Paul McCartney was the first British pop star to publicly admit using LSD, in chatting with a reporter who had enquired about it. Paul's LSD quote appeared in Queen, a UK-based magazine at the time. The quote was also then reprinted by Life magazine in their June 16th 1967 feature, 'The New Far-Out Beatles: They're grown men now and creating extraordinary musical sounds' by Thomas Thompson. In both articles, Paul McCartney was quoted as saying, "After I took it (LSD), it opened my eyes. We only use one-tenth of our brain. Just think what we could accomplish if we could only tap that hidden part. It would mean a whole new world." ITV seized the opportunity to interview Paul about this public admission. The controversy would become a springboard for discussing the responsibilities of celebrities and journalists. 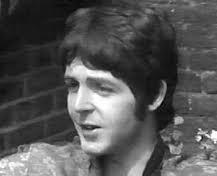 The following interview was filmed by ITV on June 19th 1967, in Paul's backyard garden on Cavendish Avenue, and would be telecast in Britain later that evening. Paul had just celebrated his 25th birthday the previous day. The Beatles' latest LP 'Sgt. Pepper's Lonely Hearts Club Band' was number one on the album charts -- released less than three weeks prior on June 1st. Q: "Paul, how often have you taken LSD?" PAUL: (pause) "About four times." Q: "And where did you get it from?" PAUL: "Well, you know, if I was to say where I got it from, you know, I mean... it's illegal and everything... it's silly to say that, you know. So I'd rather not say that." Q: "Don't you believe that this is a matter which you should have kept private?" PAUL: "Mmm, but the thing is -- I was asked a question by a newspaper, and the decision was whether to tell a lie or tell him the truth. I decided to tell him the truth... but I really didn't want to say anything, you know, because if I had my way I wouldn't have told anyone. I'm not trying to spread the word about this. But the man from the newspaper is the man from the mass medium. I'll keep it a personal thing if he does too you know... if he keeps it quiet. But he wanted to spread it so it's his responsibility, you know, for spreading it not mine." Q: "But you're a public figure and you said it in the first place and you must have known it would make the newspaper." PAUL: "Yeah, but to say it is only to tell the truth. I'm telling the truth, you know. I don't know what everyone's so angry about." Q: "Do you think that you have now encouraged your fans to take drugs?" PAUL: (clearly and calmly) "I don't think it'll make any difference. I don't think my fans are going to take drugs just because I did, you know. But the thing is -- that's not the point anyway. I was asked whether I had or not. And from then on, the whole bit about how far it's gonna go and how many people it's going to encourage is up to the newspapers, and up to you on television. I mean, you're spreading this now, at this moment. This is going into all the homes in Britain. And I'd rather it didn't. But you're asking me the question -- You want me to be honest -- I'll be honest." Q: "But as a public figure, surely you've got the responsibility to..."
PAUL: "...No, it's you who've got the responsibility. You've got the responsibility not to spread this NOW. You know, I'm quite prepared to keep it as a very personal thing if you will too. If you'll shut up about it, I will."